Over the last six years I had the Cooler Master HAF 922 computer case. At that time I liked the design, but a few reasons lead to a wish for a new case. 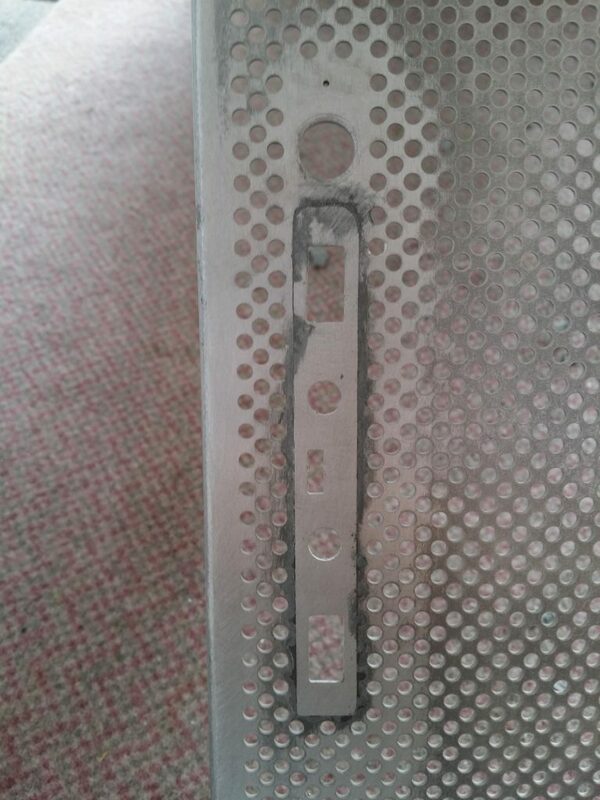 First of all the build quality of the old case was not up to today’s standards. The lack of USB 3.0 ports in the front was annoying for using fast USB storage media. But overall it was okay, until I saw the In Win 805 last winter. 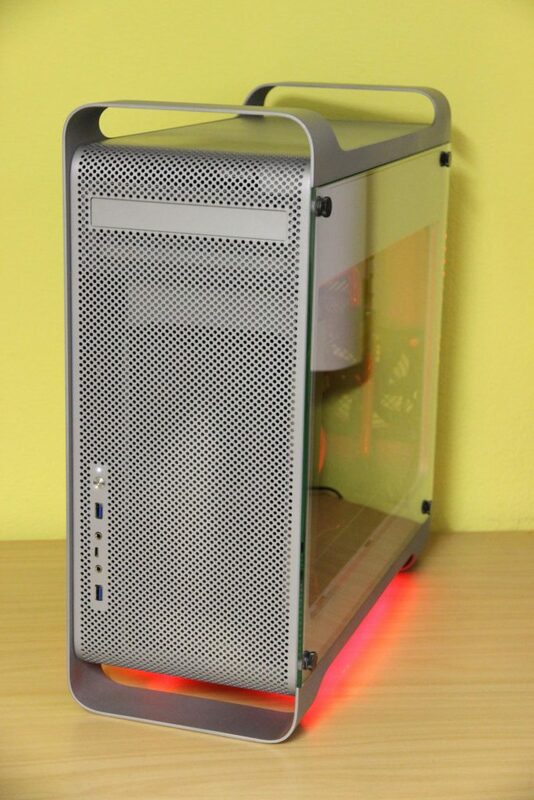 The simple and high-quality design in combination with the tempered glass side panel made me want to build a new PC in this case. Since I was busy with work for my bachelor thesis, the “New PC”-project was paused until June. Over this time I thought what features of a PC would be important for me. A quiet, good-looking, powerful and cheap PC is the vision of every PC owner. 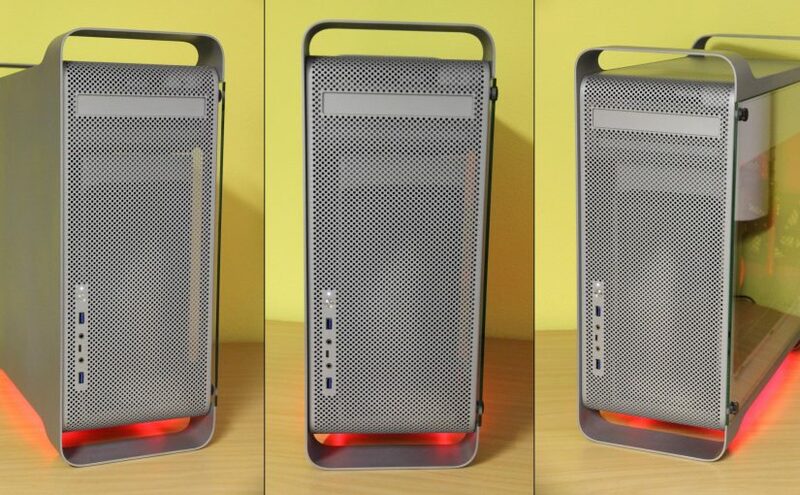 But often powerful PCs require big, noisy air coolers. And cheap doesn’t go with any of the others. So one must evaluate, which objectives are more important. I also realized that the In Win 805 wasn’t the perfect PC case. I missed the option for an optical drive. But since my new PC should have watercooling, the support for radiators bigger radiators (A 360 mm in the front and 120 mm radiator in the back) could potentially compensate for that. 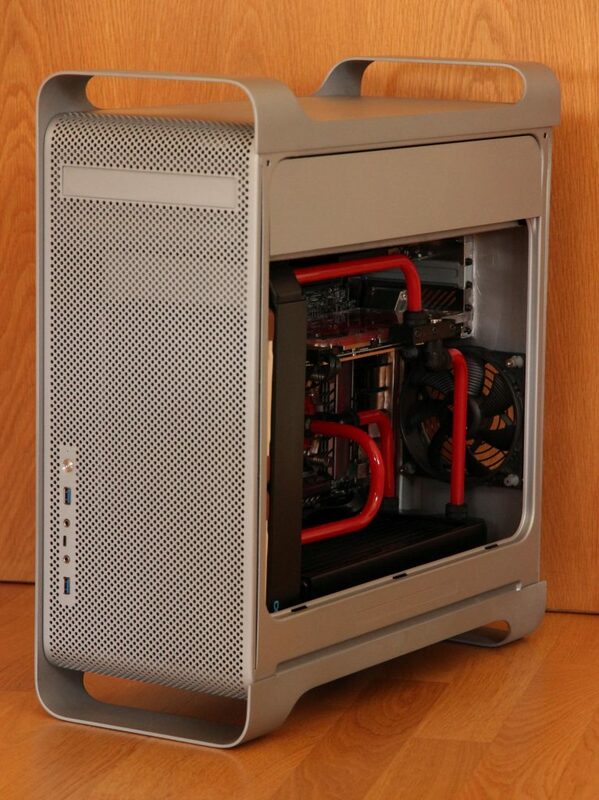 The support of the HAF 922 wasn’t satisfactory (A 240 mm in the top and 120 mm radiator in the back). But the price of over 170 € at the time held me back from immediately buying the In Win 805. 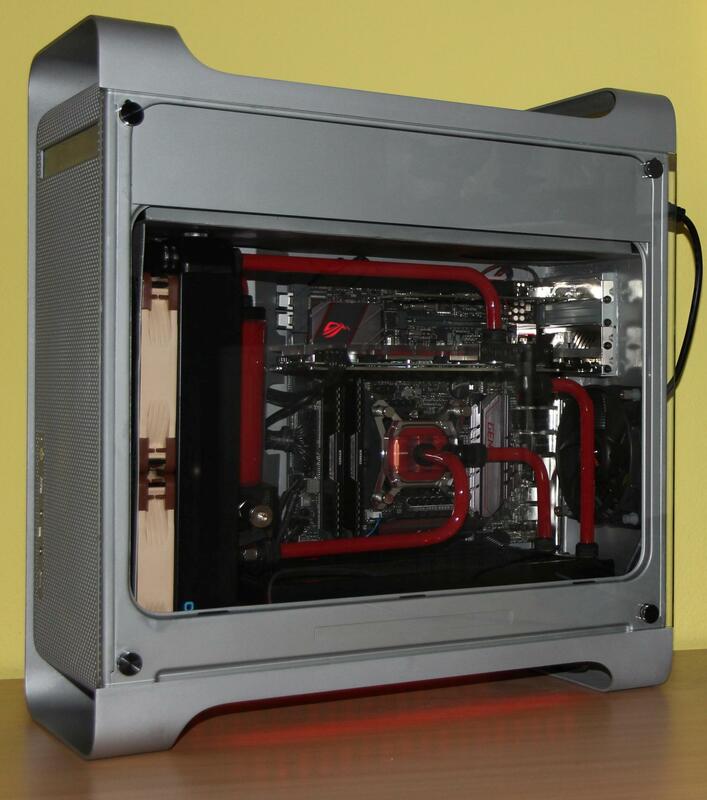 After looking around in build logs on many forums, I found an other candidate for my new PC case. A few people bought old Apple Power Mac G5 cases and changed them internally to fit ATX mainboards. Most of them used professionally made, lasercut conversion kits available for around 100 €. Those kits let you mount an ATX mainboard and use the back IOs. 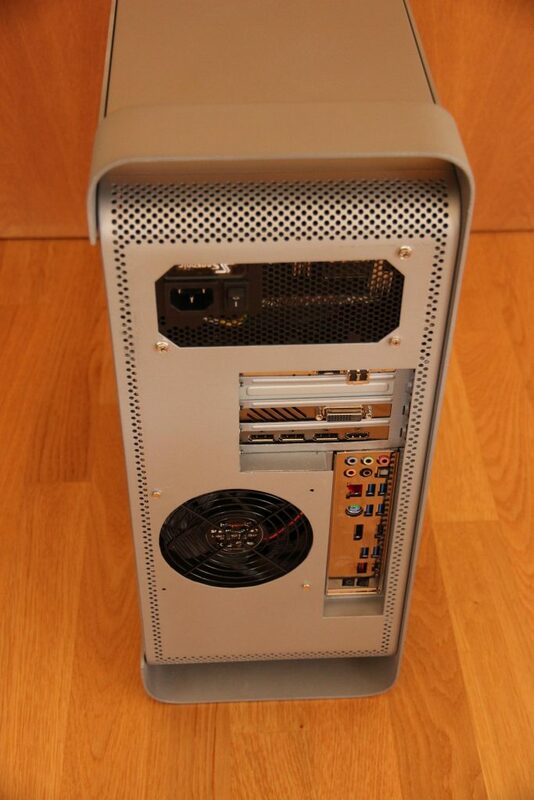 But those kits didn’t made the Apple Power Mac G5 watercooling-ready. 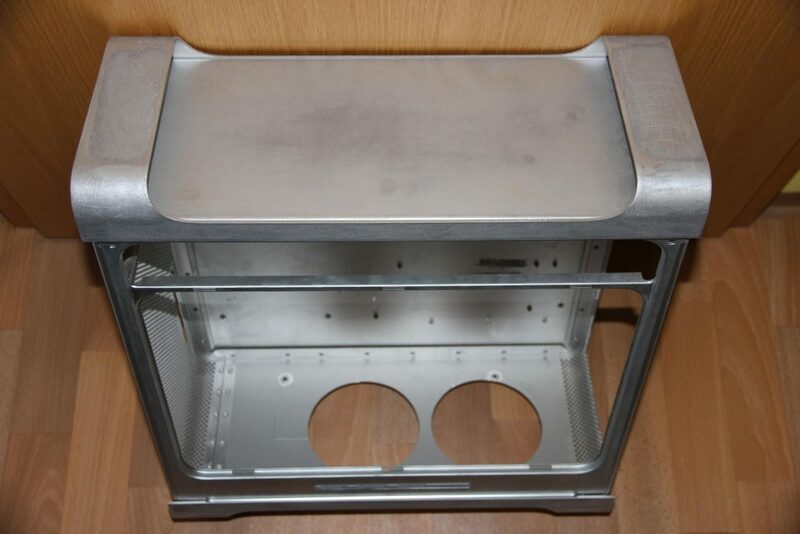 Considering my experience and knowledge I gained with the eGPU project, I thought, I could design a few lasercut aluminium pieces. 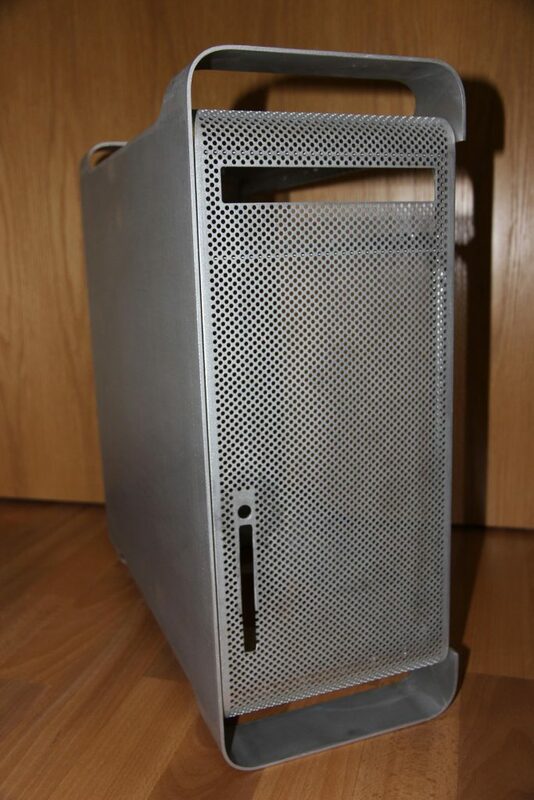 Since a lot of the Apple Power Mac G5 cases on Ebay were in a poor condition or overpriced, it took a few weeks until I finally got my case. 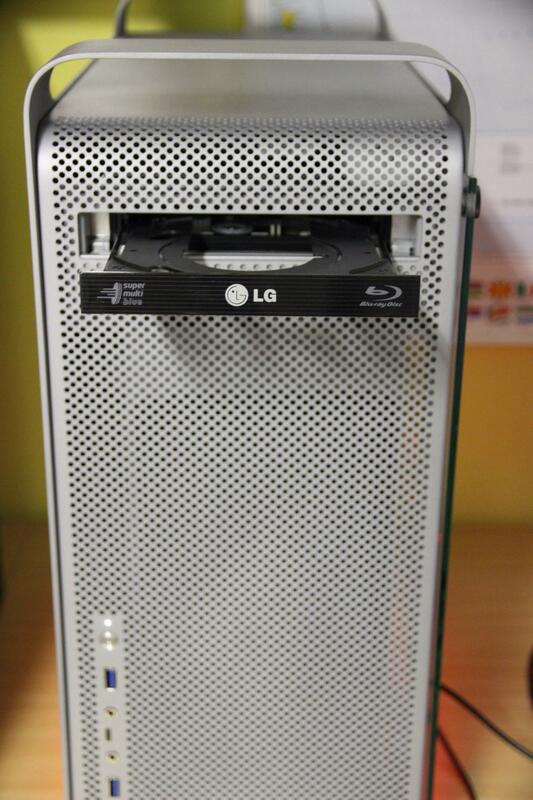 Because the Apple Power Mac G5 series is now over 10 years old, many things have to be changed. 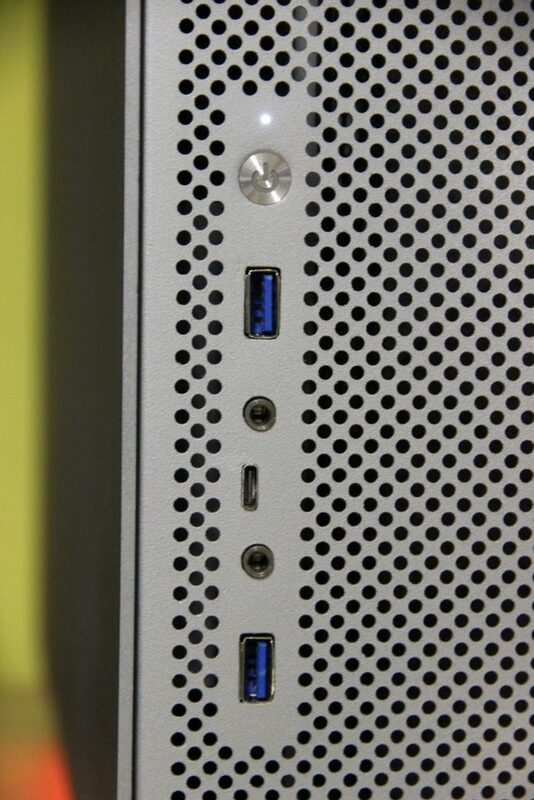 The front USB 2.0 and firewire connectors aren’t up-to-date. The back IO and the mainboard tray have to be changed to fit a µATX mainboard. Also there should be 280 mm radiators in the front and bottom. The optical DVD should be replaced with my BluRay drive. 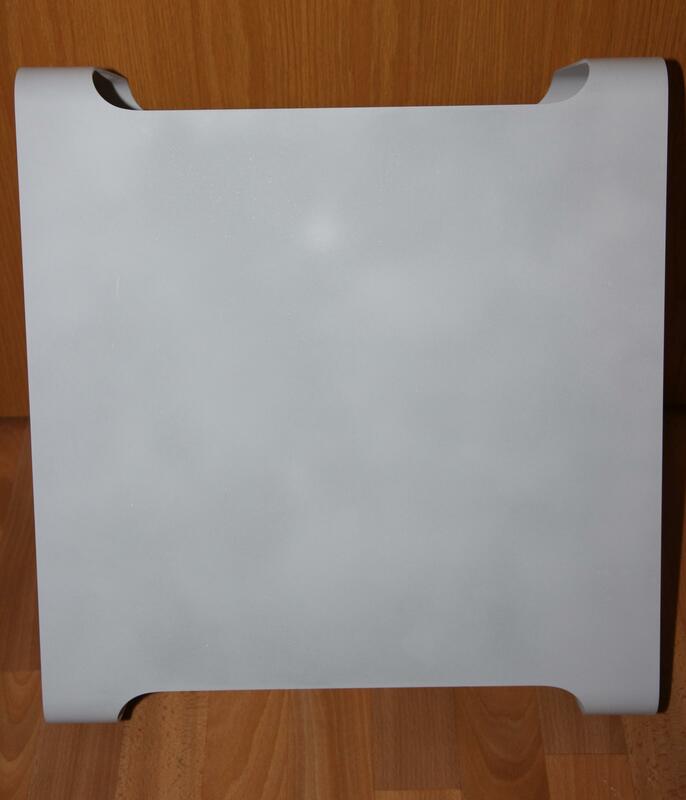 Since I liked the tempered glass side panel of the In Win 805, this casemod should feature likewise a tempered glass side panel. The outer part of the polished case. Cut out the original front IO. Backside (PSU-Mount, Back IO, and 120 mm exhaust fan) and bottom (2*140 mm radiator intake). Test fitting the new front IO with the lasercut aluminium. Glued in the aluminium piece. Finished PC without side panel. Red and grey color scheme. Front IO with audio in and out, and two USB 3.0 and one Typ C port. It depends on your skillset and how you value your time. Those conversion kits are about 100€, all my lasercut pieces were 75€. If you need any other lasercut pieces (besides the back) to complete your mod, I would get everything lasercut including the backpanel. Also if you need any help, the cad-file or have questions, just ask. Hey, what an awesome project. I would like to try and make my own, would you mind sharing plans / files you already have? How did you make the new parts look so original? Would did you attach them? Very nice, one of the cleanest I’ve seen. I’m collecting ideas for my own version and I’m interested to know where you found the board for the front I/O. 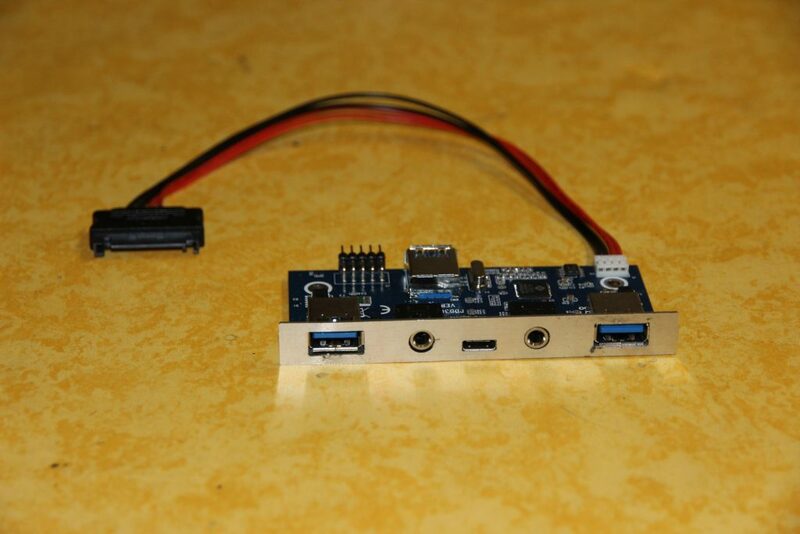 search ebay or aliexpress for “USB 3.1 Type C audio front panel”. They should cost about $14. This looks absolutely gorgeous! Also a big thank you for sharing your lasercut files, which front IO you used etc. How did you mount the tempered glass and how much did you end up paying to have it cut to size or did you do that yourself? I bought the tempered glass from a local shop for 50€. They cut it to size and drilled the holes. 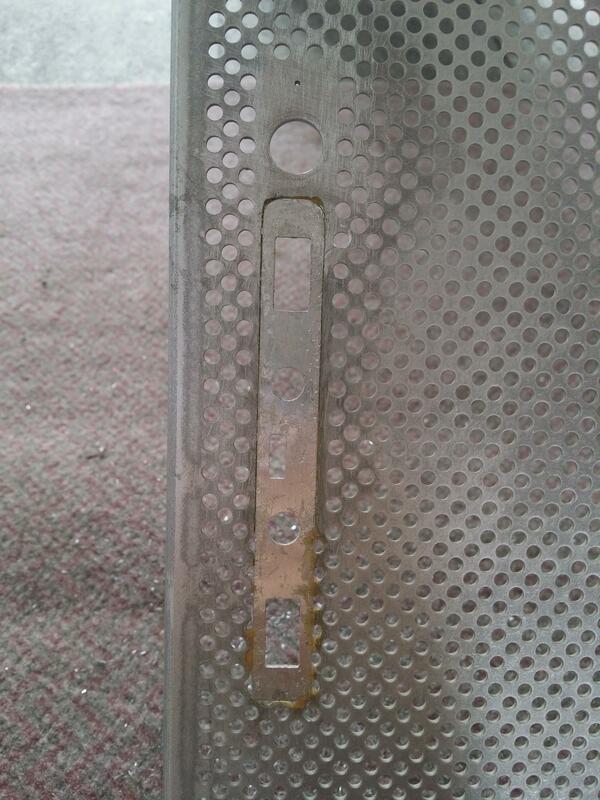 The side panel is mounted with threaded rubber standoffs I glued onto the aluminium side. Four thumbscrews hold the panel in place. Is the dxf file corrupted for anyone else? I cant seem to extract it from the zip (error 0x80004005). Could you possibly email the file directly to me? Aside from that this looks awesome! Works for me, I used 7zip to extract the zip. I emailed you the file. – What aluminum did you use to get the texture looking so similar? I’d be grateful to hear about your experience. I used metal spatula  to connect my lasercut parts to the case. Anyplace where to much metal spatula was applied, I removed it with sandpaper. Then everything was sprayed with paint. Someone asked a similar question in the update post . Thanks for the quick response! Did you cut out the parts from your replaced side panel? No, I ordered the parts online. See the dfx file at the end of the post. 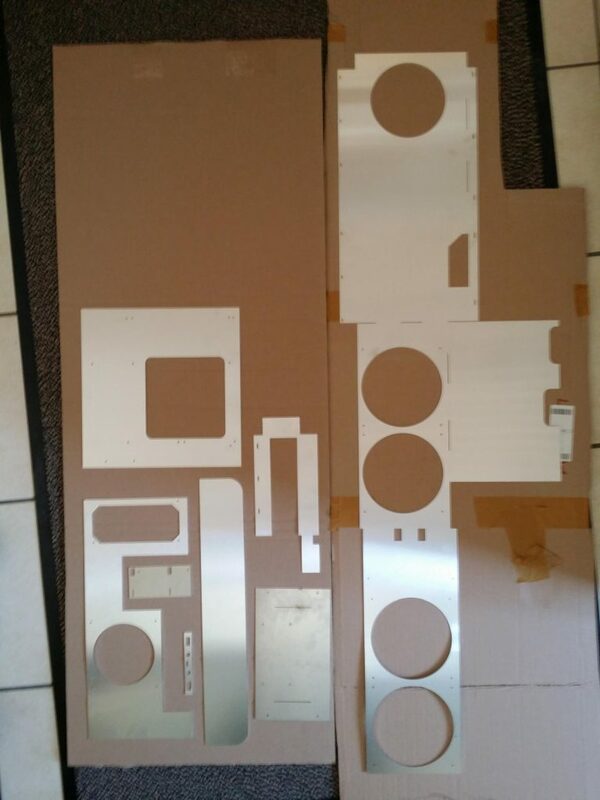 So I plan to use your back plate, Motherboard tray and front panel shield in my build, as I think I can get the pieces laser cut where I live. Quick questions though, for your motherboard tray will I need to make custom standoffs or do they use the original standoffs? 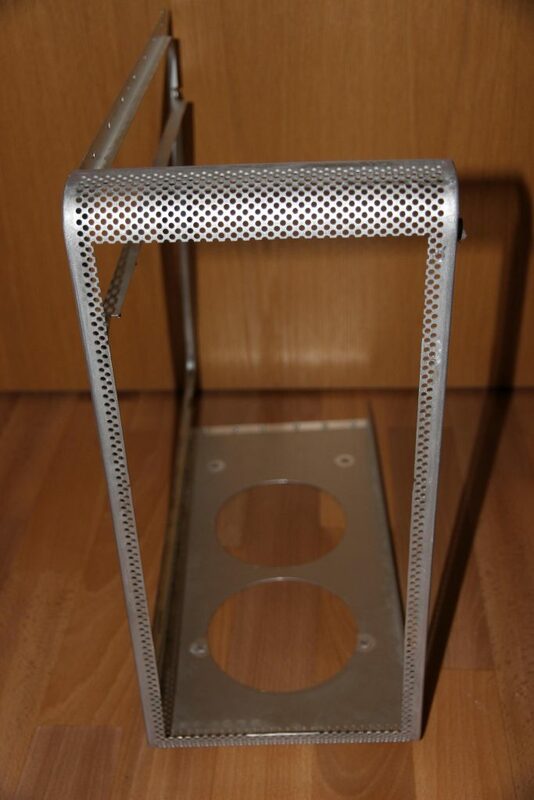 For the backplate are you using the G5’s mounting section for like the Video card? I guess another question would be, is your board MicroATX? And for the Front Panel connector, will apples power button connector fit on my motherboard or will I need to mod that too? 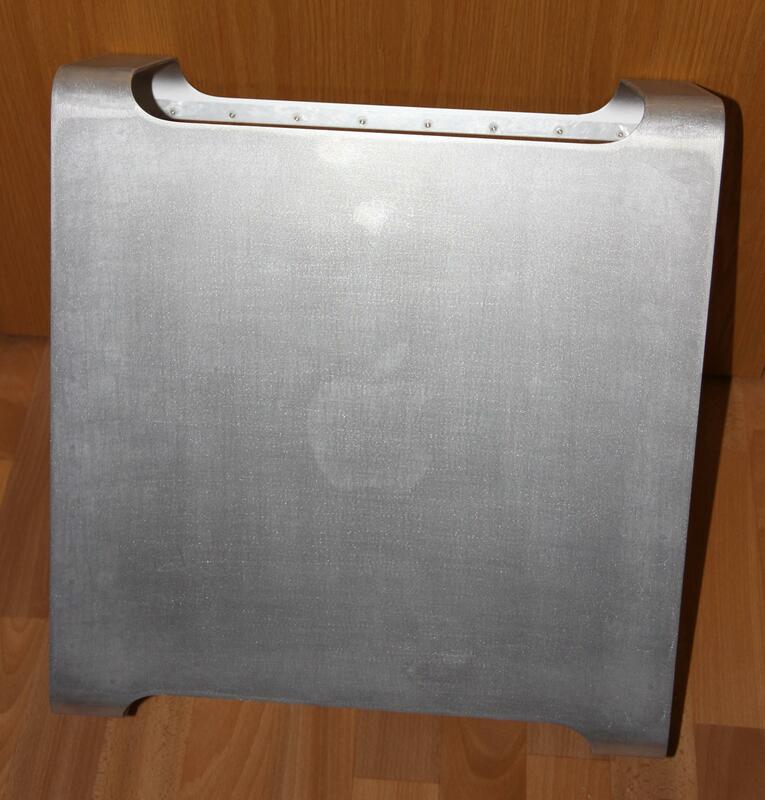 And for clarification, Part 1 is the backplate, 2 is the Front IO shield, and 3 is the motherboard tray? I used the standoffs from an old case. The video card mount is in its original place. The power button is connected with three wires (Ground, Led+, Power). I added a connector to these wires so I can easily plug it onto the mainboard pins. Yes. But I updated the dxf-File (new version I uploaded today).